BlackBerry had an announcement of its own for the MWC19 event. It was not for a new device, however, but for a new variant of the pre-existing Key2. It is a vibrant, red, dual SIM, 128GB version of this phone. BlackBerry had an announcement to make in conjunction with MWC19...of sorts. 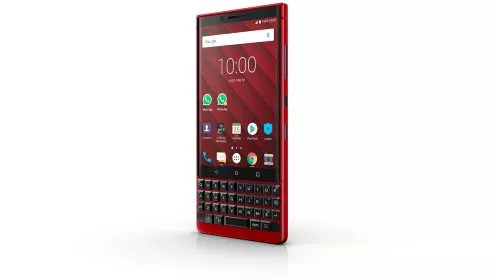 It was made to launch its new variant of the Key2 phone. This version is red, whereas the phone in question has only been available in black or silver. The new red BlackBerry Key2 has dual SIM slots and an internal storage capacity of 128GB. This phone is somewhat exceptional in 2019 terms as it has a physical keyboard. It takes up roughly half of the Key2's front panel. The rest is taken up by the phone's 4.5-inch display. It also has a 12MP camera and is powered by the Snapdragon 660 processor. The new red version is still on Android 8.1 (Oreo) and is only offered with a QWERTY keyboard. The red BlackBerry Key2 is available for purchase now on the brand's EU website for €779 (US$885). On the other hand, the black SKU with the same internal storage is €699 ($794). For the extra money, the new variant also offers new software features, including an Action Bar in the BlackBerry Hub+ and a refreshed UI for the Calendar and the BlackBerry Hub.